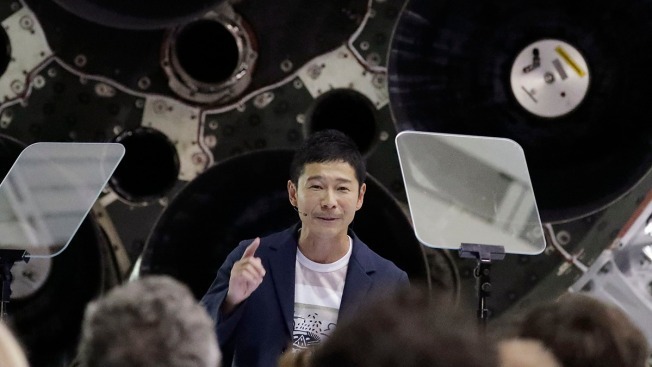 Japanese billionaire Yusaku Maezawa speaks after SpaceX founder and chief executive Elon Musk announced him as the person scheduled to be the first private passenger on a trip around the moon, Monday, Sept. 17, 2018, in Hawthorne, Calif.
From the 70th annual Emmy Awards to a billionaire announcing that he's taking a vacation to the moon, here's a look at the stories you need to know today. Rabies can be deadly for both pets and people, that’s officials have extended a health alert for one South Florida neighborhood after a sixth raccoon tested positive for rabies. Rabies can be fatal for your pet, so make sure your fur kids are up to date on their vaccinations. Tip: don’t leave food outside and stay away from stray animals. Authorities have released an updated sketch for the person who attacked two high school students at Florida International University's campus in Biscayne Bay last week. The suspect is described as having brown eyes, 5’ 10” and between 18-20 years old. Japanese billionaire entrepreneur Yusaku Maezawa says he's dreamed of visiting the moon since he was a child. Now, his dream may soon come true. Maezawa announced he’s taking the 240,000-mile trip with a group of artists for an undisclosed amount of money. He says he’s already paid a down payment for the weeklong ride, but won’t takeoff until 2023. It’s National Cheeseburger Day and many places are celebrating around South Florida with beefy and cheesy eats. And yes, there are deals. But before you head out to celebrate, here are some of the most popular burgers that South Florida has to offer. Tonight, NBC 6 is airing a special documentary, “Louder Than a Bomb: The Parkland Poets.” The original doc goes into the space where students from Marjory Stoneman Douglas High School can poetically share their stories about the Valentine’s Day tragedy that occurred on campus. The documentary air at 7 p.m. on NBC 6, but you can also watch it on our YouTube channel here.